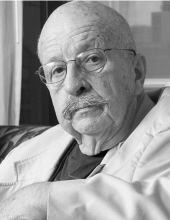 Gene Wolfe, of Peoria, formerly of Barrington, IL, one of the world's most respected contemporary science fiction authors, passed away Sunday, April 14, 2019 after his long battle with heart disease. Wolfe was 87. He was born on May 5, 1931 in New York, NY and married Rosemary F. Wolfe on November 3, 1956. Wolfe is survived by his daughters Madeleine (Dan) Fellers of Mountain Home, AR, Therese (Alan) Goulding of Woodridge, IL, son, Matthew Wolfe of Atlanta, GA and 3 granddaughters, Rebecca (Spizzirri), Elizabeth (Goulding) and Alison (Goulding). In addition to his parents, he was preceded in death by his wife of 57 years, Rosemary F. Wolfe and son Roy E. Wolfe. Wolfe fought in the Korean War and after returning to the United States became an industrial engineer at Proctor & Gamble. Following his career at P&G, he worked for many years editing the engineering review "Plant Engineering" before retiring to write full-time in 1986. Gene Wolfe was the author of over fifty novels and hundreds of short stories, poems and essays, first published story was in 1965. He is best known for the three multi-part series The Book of the New Sun, The Book of the Long Sun, and The Book of the Short Sun, as well as for the acclaimed duology, The Wizard Knight. Wolfe was well-known for his dense, allusion-rich prose as well as the strong influence of his Catholic faith. A prolific short story writer as well as a novelist, he was awarded the Nebula Award, the John W. Campbell Award, the World Fantasy Award, the British Science Fiction Award, the Locus Reader’s Poll, the Rhysling Award and many others. In 1996, he was given a Lifetime Achievement Award by the World Fantasy Convention, and in 2007 he was inducted into the Science Fiction Hall of Fame. Friends knew Wolfe as a humble, soft-spoken man who enjoyed a good joke. He kept a low profile in Peoria, giving talks and readings locally every few years. He never sought publicity, though always obliging reporters for interviews. A Funeral Service will be at 2:00 PM on Thursday, April 18, 2019 at Wright & Salmon Mortuary, with a 2 hour prior visitation, beginning at noon. Fr. David Richardson will officiate. A burial will follow at St. Mary’s Cemetery in West Peoria, IL. Memorials in Wolfe’s name, may be made to American Heart Association. To send flowers or a remembrance gift to the family of Gene Wolfe, please visit our Tribute Store. "Email Address" would like to share the life celebration of Gene Wolfe. Click on the "link" to go to share a favorite memory or leave a condolence message for the family.